Different motorcycle riders have different riding style and the reasons why they ride are also various. Some bikers love wearing kinds of leathers hanging out around their living areas with their motorcycles. 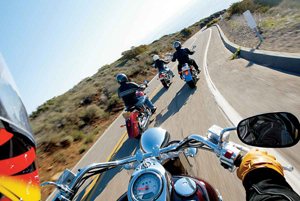 Some bikers ride motorcycles in order to meet more like-minded biker friends. While some bikers ride motorcycles just for pursuing a more exciting and stimulating life. Well, as for bikers who desire for an exciting life, motorcycle touring can absolutely meet their need. It is a special kind of adventure which allows biekr girls and guys to imagine that they are like an eagle flying in the sky while they are riding motorcycles on the highways at a fast speed. And they think that is a real life. Why? What attracts them to the road? It is true that most bikers like twisty roads, since riding on this kind of roads is much more fun and exciting than riding on plat roads. Riding on a straight plat road is good and safe, but it cannot bring motorcycle riders more beautiful sceneries and wonderful memories. Riding on a twisty road with your biker woman is not only a kind of special experience but also a way to enhance the feelings of you two. So, if you are going to make an unforgettable memory for your biker girl, you can bring her to ride a motorcycling trip on the twisty path. There are some roads which have many charming and beautiful scenic spots along them. Highway 163 in the US, which is located in the Arizona, Utah border, is a good example. This road itself is dull, straight and boring, but there are spectacular and wonderful landscapes along the way attracting many bikers to visit. Sometimes, a road is regarded as the best one just because of its distance. There are amazing and interesting sceneries along Pacific Coast Highway in California, and most motorcycle riders consider it as a great and best-loved riding road with about 1000 miles at total length. Every motorcycle enthusiast knows the landscape due to its unique geographical environment. It is better to ride from north to south, beacause you will be on the ocean side of the road all the way. That's why it is called the most scenic road in the word. Most motorcycle touring enthusiasts including men and women will go there with their motorcycles at least once in their whole riding career. So, if you are a single biker looking for another single biker for love and friendship, riding on this beautiful road will be a good choice. In a word, it depends on the riding habit of the different riders when they how choose a riding sytle. Twisted roads, landscapes along the roads and the distance of the roads are just some factors to be taken into consideration. Anyway, having a motorcycle riding on those beautiful roads is a good way to meet like-minded biker friends, or hook up with other biker singles who have the same interest as yours.